1. Democracy as a concept needs to be decolonized. One of my favourite moments of the conference was Leah Bassel’s keynote titled “The Politics of Listening” in which she emphasized that “we need to decolonize the concept of democracy”, and asked “why should we go to Ancient Greece as our democratic ideals if those were unequal, exclusive societies? Why not go to Black scholarship, critical race theory, Indigenous perspectives for our democracy?” In her keynote, she also shared a sentiment she had heard from Black women while doing her research: “I wish white women would stop trying to save us. They only listen to you if you bash your culture.” Prioritizing decolonial scholarship is something many women of colour scholars have stressed in their work, and Leah Bassel’s keynote was an example of being a wonderful co-conspirator. I loved her lecture. She wasn’t celebrating herself, she was simply offering ideas while also giving credit to scholars who have been doing this work for a long time. Since her talk I’ve been reading her book “The Politics of Listening”, and have been thinking about how revolutionary the act of listening can be if it is done with open hearts and a spirit of humility and recognition rather than the defensiveness that too often permeates conversations about social change and oppression. 2. Democracy is strengthened through relationships and deep conversations. For me, the best and most meaningful part of Demcracy Xchange was the opportunity to meet people from across the country who are committed to social justice and making cities and communities better. My deepest moments of learning were the conversations over meals, in the lobby of the conference venue and over cups of tea. The conference was a reminder that there is so much work to be done, and that we are better able to support ourselves and one another when we know each other, and when we develop relationships that are nurtured long after the conference days are done. 3. People feel seen and more able to step in to participate when their physical needs are attended to. I loved that each meal had halal food options. It’s rare to be at an event where Muslims are seen, and even though I mostly ate vegetarian food over the weekend, I appreciated that halal food was available. I also appreciated that there were chairs for the meals so that we didn’t have to stand and eat, and even at the evening reception, I found space where I could sit when I was unable to stand and still participate in conversations. 4. It takes resources to shift systems and spaces to be more reflective of the demographics of our country. There was discussion at the conference about having younger delegates and BIPOC delegates at the conference, and creating a more diverse space requires concrete action to make that happen. I am grateful to Inspirit for making it financially possible for me and others to attend Democracy Xchange and I met other people who had been funded by other organizations. Although there is definitely more work to be done, I’m glad that there are funders and organizers who are committed to devoting resources to making spaces like Democracy Xchange more diverse. 5. There is a different, much needed, narrative around design that is rooted in social justice. 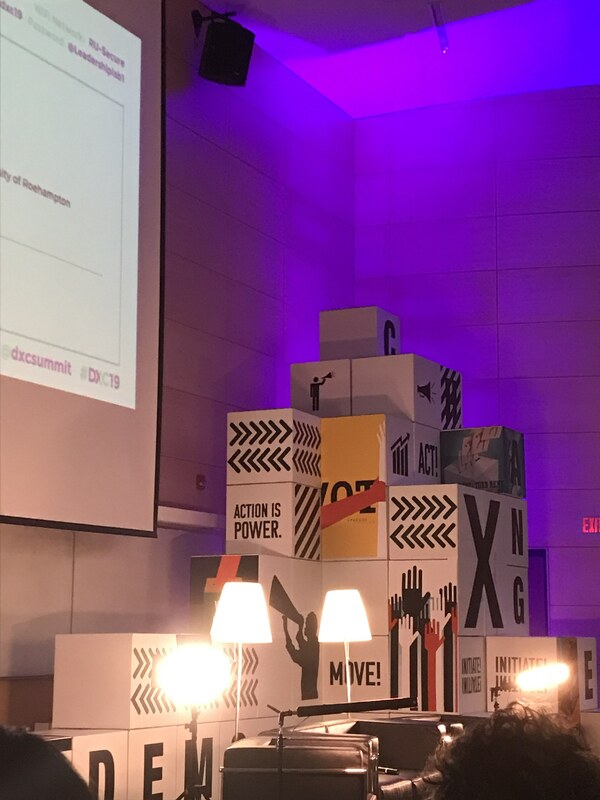 One of my favourite sessions at Democracy Xchange was the session about art and collective change, and the “Design as Protest” session facilitated by the phenomenal Bryan C.Lee Jr of Colloqate. The work of Colloqate roots design process in social justice frameworks rather than design that begins from human centred design (a framework that has gotten far too much airplay and has been heavily critiqued by many different theorists as simply preserving the status quo instead of producing social change). In October I started a certificate in Social Innovation at Simon Fraser University, and one of the things that has been missing from my education is design resources that begin from social justice rather than IDEO approaches. Because of that gap, I have been researching and learning more about socially just design processes and doing my own learning. The problem with the way design is taught right now is that it prioritizes white practitioners, readings by white individuals and silences and ignores the work of people of colour, and part of the reason I was interested in Democracy Xchange is that I wanted to meet more practitioners who are doing this kind of work. Towards this end, the session with Bryan definitely delivered and I’m so looking forward to delving and learning from Colloqate over the next several months. 6. Democracy is strengthened through micro-moments of kindness. At some conferences, people rush from session to session and try to soak up as much knowledge and business cards as possible. At Democracy Xchange however, although the agenda was packed, the actual conference space was limited to a small geographic space, so the time felt more spacious. Given that just a few days earlier I was in the emergency room, I wasn’t well during the conference, and I appreciated every act of kindness and every person who sat with me while I was unwell instead of simply barrelling onto the next scheduled part of the day. And because my own health was fragile, I thought a lot about how how important it is to have democracy conversations that extend beyond being physically in a space. I am still thinking about this question: how do we bring conversations about democracy and civil society to those who are not well enough or resourced enough to attend and participate? 7. Academics, foundations, media, public institutions and residents all play a role in strengthening and creating a flourishing democracy. Democracy is so much more than voting and supporting political parties. The filmmaker Astra Taylor spoke in her opening remarks about how her own relationship with the word democracy has changed over the last ten years, and through participating in Democracy Xchange, my own relationship with the word altered. Over that short weekend I felt inspired by artists creating conversations about social change and democracy through their work, I was excited by the work of libraries to offer spaces for dialogue, curiosity exploration and dignified participation without expense, and I was energised by work of activists such as those working to broaden and enliven the Smart City conversation in Toronto and beyond. Before the conference I wasn’t sure that conversations about democracy were meant for me, attending Democracy Xchange was a lesson that conversations and spaces about democracy most definitely matter to me. 8. Intergenerational love needs to be talked about and supported. In his opening remarks to the conference, Michael Champagne spoke about how intergenerational trauma is real, but we also need to talk about how Indigenous people are still here because of intergenerational love. We need to bring love into the scope of our conversations about democracy. 9. “Crisis is a term from ancient Greece. It’s a time in a disease where you either get better or you die.”~ Astra Taylor. Though Astra spoke about the crisis of capitalism, for me Astra’s reflections were a reminder to think about moments of personal crisis as well and to use those moments to think about what your body is telling you, what the systems around you are telling you, and to use those moments as opportunities for change-making, for changing course and for self-reflection. 10..Everyone has a responsibility to create more equitable spaces. Although I thought that the panel on Women, Power and Intersectionality should have been moderated by a woman of colour, I appreciated the gems shared by the Indigenous and racialized women who participated in this discussion. Kyla Kafwi Scott spoke about being a mother, a daughter, a student having a full time job and giving a full-time commitment to her nonprofit Dene Nahjo and not wanting her kids to have to work as hard. Denise Siele spoke about the challenge and accountability of coming from community and being the one of the first to be in a space – it means that there is no room for mistakes, and there is “a whole cadre of people watching you and keeping you accountable.” Overall, what all of these women emphasized is that the responsibility of building inclusive systems, challenging racism and xenophobia and marginalization, and striving for fair representation is work that must be shared among all of us. Racialized people cannot change Canada all by ourselves. Everyone’s commitment to this work is needed. For more detailed reflections and to follow my conference takeaways, you can find me on Twitter @shaguftapasta using the conference hashtag #DXC19.